Microsoft is expanding their visions and credibility in its latest version of Windows operating system, but the updates are not always working well for everyone. Many people report that there is no sound on their Windows 10 laptops. The latest update of Microsoft Windows 10, which was released in October 2018, was a huge bunch of bugs and issues. People were not expecting the audio issue from that update, but it happened and confused a lot of users. A problematic update could also cause data loss, in which case a good file recovery tool will be needed. Therefore, be cautious before you decide to rush to a new update, or you can even disable Windows 10 auto update. 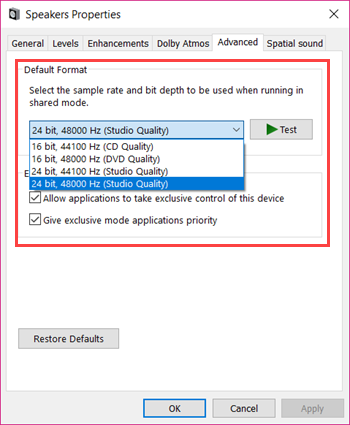 There are also a few other factors could cause audio issues on Windows 10. 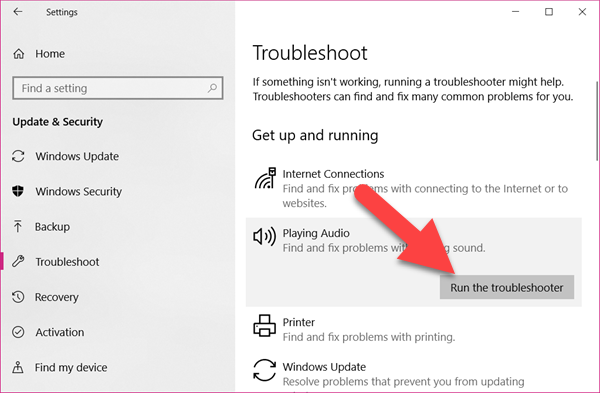 If you’re also unable to switch the sound on or turn it up or down, then the following solution might fix the no sound problem on your Windows 10 laptop or desktop. It is also recommended to try some basic troubleshooting steps first. Most of the times, the issue is what we consider a very non-sense step. Check if the cables are in position. Make sure to plug the audio jack into the right port. Check the plug of your speaker. Is it switched on and working fine? Check the audio icon placed in the extreme down right corner of your desktop. Check if it’s muted or down low. Also check the volume of your speakers too. Most Windows 10 users don’t use the troubleshooter only because they assume it won’t work. But trust me, Windows 10’s troubleshooter is a helpful feature to try first for technical issues. Click the Start menu, then go to Settings > Update & Security > Troubleshoot. Playing Audio should be near the front on the list. If not, scroll down to find and click it, then choose Run the troubleshooter. Follow the instruction provided by the troubleshooter. The troubleshooter will automatically find the issues and try to solve it. There are more options, such as Recording Audio and Video Playback, on the Troubleshoot list. In most cases, you don’t find a need to go for further solutions. If there is still no sound on your Windows 10 laptop, then check more options below. Device Manager is a place where Windows keeps all the information and settings about every hardware and driver. Our main purpose is to find that if the sound card and its driver are working properly or not on Device Manager. Press Windows key + X key, then choose Device Manager. 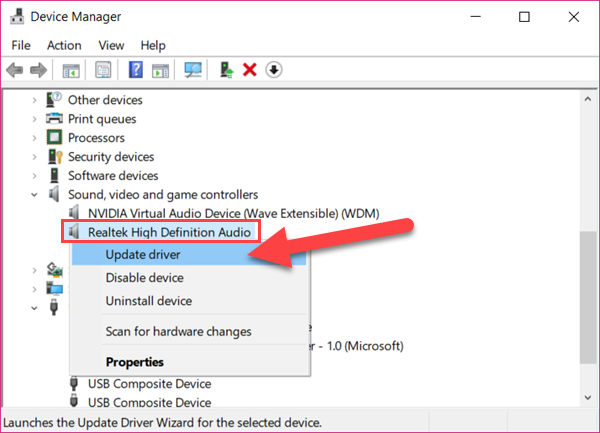 Look for the option for Sound on Device Manager and expand it. Now right-click the sound card which should be similar to High Definition Audio Device. Choose Update Driver on the right-click menu, then click Search automatically for updated driver software and follow the wizard. You can visit the manufacturer’s website and look for the update for your sound driver manually. Apart from this, you can select the other option on the last step – Browse my computer for driver software. You can find the default driver on your computer which should be compatible. 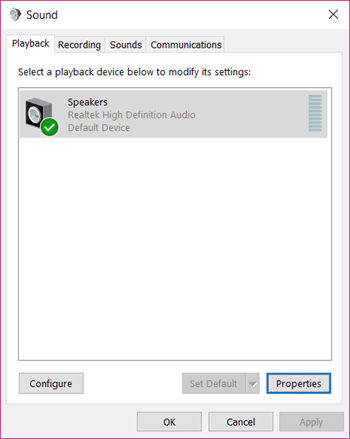 Another common option that works all the time is to set your playback device as default from the sound settings. Click Start menu, then type Sound and open it from the matched result. Under the Playback tab, select the playback device and click Set Default button. This will probably solve the audio issue on Windows 10. If the above method does not fix the audio issue, you can go further. On Playback tab, select the default device, then click Properties. On Advanced tab, below Default Format, select another option and hit Test. You can repeat the above steps but select another format and hit play. Keep doing so until you hear the sound, then click Apply > OK to save the changes. 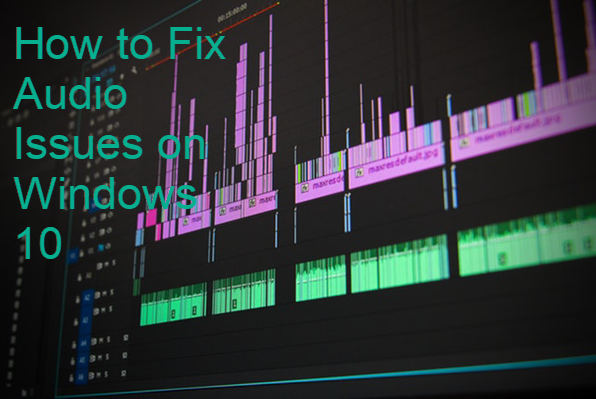 With the above solutions, you should be able to fix Windows 10 audio issues. While using computers for work or entertainment, we could also run into other critical errors on Windows 10. Feel free to tell us if you have any questions or solutions.